Rotherham MP Sarah Champion is furious with the Government for not doing more with information on the prospects for the UK steel industry as Tata Steel announces that its European subsidiary is to "explore all options for portfolio restructuring including the potential divestment of Tata Steel UK, in whole or in parts." Having taken part in a top-level summit hosted in Rotherham last year to discuss the challenges currently facing the global steel industry, the Rotherham MP went on to speak to a Commons a debate on the Government's support for the steel industry, where she explained that the impact of losing Rotherham steel would be "incalculable." Yesterday, the Indian-owned steelmaker, which up to 2015 employed around 2,000 people in South Yorkshire, announced plans which could lead to UK operations being sold. 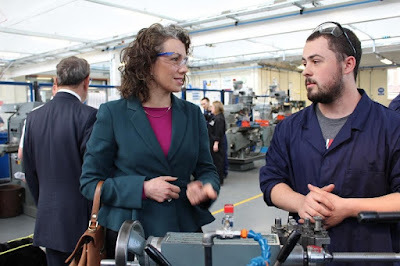 Sarah Champion MP responded: "I am angry and frustrated by Tata's announcement that it plans to sell its UK plants and restructure its operations. It is another blow to one of our most important industries and to the workers and communities who rely on it. "In Rotherham, hundreds of steel workers were handed redundancy notices from Tata earlier this year. This announcement raises fears about more job losses. These skilled workers and the high specification steel they produce need a level playing field to succeed that this Government has so far been unable to deliver on. "We need a clear and detailed statement from Tata on its plans for operations across the UK, so that all involved can begin to plan effectively for the future of the steel industry. We then need the Government to stop shirking from its responsibility and act before it's too late. "For me, the blame lays squarely at the feet of the Government. For two years, industry, MPs and the unions have been telling Ministers what must be done to secure the long term future of steel in the UK. I am furious that the Government has done nothing with this information." A statement from the Government said that it "is working tirelessly to look at all viable options to keep a strong British steel industry at the heart of our manufacturing base."